The cinema in Wotton has launched the next photographic competition for its 2014 calendar by challenging photographers to improve on the overall winner from last time. The Electric Picture House in Wotton-under-Edge has announced its third photographic competition in a bid to obtain another twelve stunning pictures for its next calendar by issuing a challenge to anyone who thinks they can improve on this year’s winning picture. 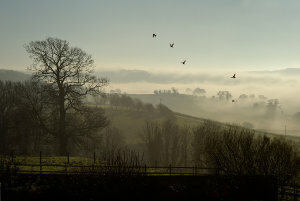 Once again the task of supplying suitable and photogenic shots of Wotton and the surrounding area has been opened up to local enthusiasts in the form of a photographic competition. He said: “The competitions for the cinema’s calendar have provided such a wide variety of wonderful pictures that we have decided to do it once again. He added: “This year, in recognition of the cinema’s close links with under-the-edge arts, some special photography workshops run by local professional wildlife photographer Iain Green are planned next month for anyone who would like to improve on their skills before entering a picture. The plan is to exhibit the best 100 pictures in July from which twelve will be selected for use in the calendar. The best overall picture will win two free memberships to the cinema’s new TAKE2 scheme plus a £50 voucher from Tortworth Court. Further details of the rules, how to submit pictures and when and where the judging will take place can be found on the cinema’s website, www.wottoneph.co.uk. More information on the photography workshops is available from under the edge arts and from its website, www.utea.org.uk.